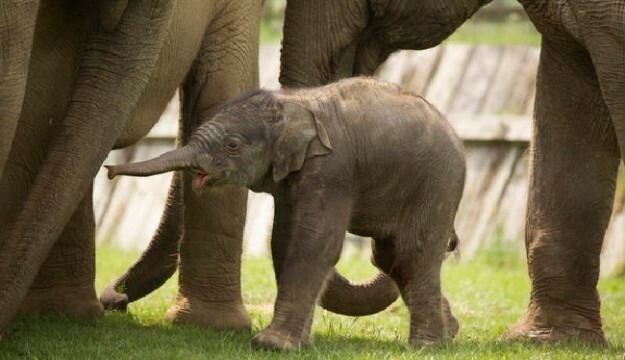 Zookeepers at ZSL Whipsnade Zoo are trumpeting the arrival of an exciting new addition, a baby Asian elephant. The pint-sized pachyderm was born on Friday 10 June, just in time for the nation’s celebrations of HM The Queen’s official 90th birthday. In recognition of her regal birthdate, keepers have given the youngster a moniker fit for a monarch, and named the five-day-old calf Elizabeth, after HM The Queen, who is also Patron of the conservation charity which runs the Zoo. Born to 17-year-old Karishma following a 22-month gestation period, and weighing in at a hefty 130kg, the young female joins a herd of ten Asian elephants at the 600-acre Zoo in Bedfordshire. Arriving slightly earlier than anticipated, Elizabeth’s mum Karishma had showed no signs of going into labour, so lead keeper Darren Fellowes was surprised to find the new addition getting to know the rest of the herd when he arrived at work in the morning. ZSL’s assistant curator of elephants, Lee Sambrook said: “Elizabeth is a great new addition to the Asian elephant herd here at ZSL Whipsnade Zoo, and we had to mark her poignant birthday with a suitably regal name. “When we know an elephant is pregnant, and nearing her due date, we do a daily hormone test to give us an indication of timescales. Karishma’s most recent test suggested we had more time than we did, but you really can’t get a better surprise than a baby elephant! Classified as Endangered by the IUCN Red List of Threatened Species, Asian elephants are also ranked on ZSL’s EDGE list, which highlights species which are Evolutionarily Distinct and Globally Endangered, due to their threatened status and unique evolutionary history.